© 2002 No part may be reproduced without written permission. My Grandfather, William James Bennett, thought most of his life his father, William Henry Bennett, had abandoned them. After the death of his father he found out that this wasn’t all true. He started corresponding with various family members to learn more about his father and his family. The letters contain stories about various family members and their genealogy. 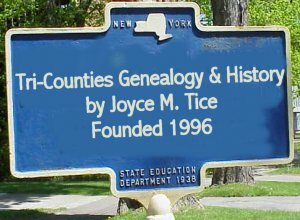 Most are descendents of Hannah Kimber and Josiah Bennett (Bennitt) but does include other people from the Tri-Counties area. They are transcribed as written. My hope in freely sharing these letters is that others will do the same and share their information with me on this family. When I finish transcribing all the letters I will attempt to identify the people mentioned within each letter. I will provide copies of the letters to direct descendents of the authors. I would love copies of my grandparent’s letters if they still exist. I will transcribe them if requested. You may contact me at casay2@attbi.com . Minnie Eudora (Herrington) Derbyshire is the daughter of Charles L. Herrington & Hannah M. Bennett. She is about 80 years old when writing these letters, was born in Wellsboro, PA and was living in Elmira, NY. Your letter received, and I am enclosing what information I have in regard to your father, who was my mother’s brother. Uncle Will’s first wife died March 29, 1927 in Kalamazoo, Mich. I don’t know whether he was living with her at the time. And I remember his saying he had left his second wife, but why I don’t know. He had four children by his first wife as follows: K. W. , ( I believe he was called Kay ) , Mary, Gertrude, and Alice. Then, by your mother, you and your brother. Am not sure, but imagine your cousin, Mrs. Gladys Doane, 216 E. 11th Street, Elmira Heights, N.Y. 14903 could give you information in regard to your father. She is a granddaughter of his – the daughter of Alice. About the letter your mother had with receipt of $10, I know nothing about. I didn’t send it, and I am sorry but I don’t know who it might have been from. We lived in Wellsboro, Pa. R.D. #2 at the time we lived where in Wellsboro, but I believe the route number has changed now. My mother was Hannah M. Bennett and she married my father Charles L. Herrington. She has been dead 39 years, and my father 37 years – they both are buried here in Elmira. My husband George R. Derbyshire, passed away three years ago. Uncle Jacob Bennett had 12 children, and all are living except Roy, who died July 22, 1942. Uncle Darwin had 8 children, and they are all dead except Lulu. Aunt Margaret Moshier had 1 daughter. Uncle Myron had 2 daughters. Uncle Sherm had 2 daughters by his first wife, and a boy and a girl by the second wife. Aunt Lilly had four children. My mother had 4 children – myself, my brother John, and my brother Fred who died in 1905 at the age of 18, and my sister Edna who died in 1883 at the age of 17 months. Grandma Bennett (David) lost his first wife in 1869. She was your father’s mother, and the oldest of that family at her death was Aunt Margaret who was 17. Your father was 12 at the time of her death. Grandpa lived up the Hendy Creek Road. Both he and Step-grandma Elizabeth, died at Uncle Jake’s home. Here is something that might interest you. When Grandpa was a young man he and Elizabeth Corwin (his second wife) were engaged to be married, but his father, Josiah, didn’t want his son to get married, so when Grandpa wrote to Elizabeth, his father Josiah who was the Postmaster at Erin would take Grandpa’s letter from the mail, and when one came from to Grandpa from Elizabeth, Josiah took that one also from the mail so that both Grandpa and Elizabeth thought neither of them cared for the other any more. Later, Grandpa was on his way to church when he overtook a girl walking and asked her to ride. This girl was Grandma Bennett (Mary Sawyer), and they later were married. After Grandma died, one of Grandpa’s aunts, Mrs. Jacob Myers, put Grandpa and Elizabeth Corwin in touch with one another, and they were married. It seems that she had never married, and when she thought Grandpa didn’t care for her anymore, the story goes that she tried to starve herself to death. My mother told me that she, Elizabeth, was a very wonderful person. She was really the only mother Uncle Jake knew for he was only 2 years old when Grandma died. Aunt Lilly was taken home by Aunt Agusta Bennett and brought up by her. After Grandpa married Elizabeth he tried to get Aunt Lilly, but Aunt Agusta wouldn’t give her up. I hope some of this will be of some help to you. Your father must have had a tough boyhood. He was not a bad person even though he probably did many things he shouldn’t have. He is buried here in Woodlawn cemetery, but I didn’t know exactly where his grave is. I do know it is near the plot (not on it) of Uncle Will Bennett, Grandpa’s brother. Grandpa Bennett’s brothers and sisters were as follows: Sarah, William Elston, David, George K., Adelia B., Peter K., Maria Elizabeth, Thomas N. (aunt Agusta’s husband), Hannah Rosannah, Samuel G., and Melissa Ann. Note: Italics are handwritten corrections by Minnie on the letter. I was going to get a letter off to you before this, but two weeks ago last Monday evening I took a tumble down the cellar steps over at my daughter’s home. I have no recollection of falling or of coming back up the cellar steps. I must have made a mis-step someway. Louise had gone to the store, and I was staying at the house in case any customers came to the rummage sale she was having. She said I was sitting in the kitchen mopping the blood off my head when she returned., I have no recollection of it. I am so thankful that no bones were broken, and I shall try to keep right side up from now on. I feel so sorry to have frightened Louise. Frank soon came and he and Louise took me to the doctor, but all I remember about that is hearing the doctor say the cut in my scalp wouldn’t require stitches. To make a long story short, I am getting along quite well. Still have a lot of pain in my back, but am able to get my meals and wash dishes, by using a cane to walk, and sitting down to rest in between. Louise brings my groceries and does odd jobs for me. I came home on Thursday after I fell ( I have a 3 room apartment ) and Ethel Bennett Munson stayed with me three days , then a friend down the street stayed four nights, and since I have been on my own. Ethel had quite a bit of trouble with arthritis in her back, but she, like myself is no Spring’s chicken. I must have made a blunder in copying the material I sent you – Jeremiah Bennett married Phebe Lain, and he was the son of Thomas and Mary Dyckman Bennett. Jeremiah must have had several brothers and sisters of whom I have no record, but wish I did. They probably could be traced. Our direct line is through Jeremiah’s son, Josiah who married Hannah Kimber, the daughter of George and Sarah Elston Kimber. My mother was named for her. I probably wrote you that my mother lived seven years ( from the time that she was 9 to 16) with her great-aunt Sally Maria Myers. I have no record of a Sally Maria Bennett Myers, so perhaps she may have been the daughter of one of Jeremiah’s brothers, or daughters, or sisters, but I’m only guessing. She was not very good to my mother. I’ve heard my mother speak of her greatgrandmother Kimber who lived with Aunt Sally Maria Myers. Mamma said the old lady had a bag of gold pieces she kept under her bed, and she used to tell Mamma about dugout cellars they had to go into when the Indians attacked. Also that the Indians would rip the feather beds apart and throw the feathers in the air and dance and yell. I can’t remember what Mamma said the Indians called this, but it was something like a Kinteykey, or killteykoy. Aunt Sally Maria Myers had four children, if I remember correctly. There were two girls, and the one was Ann Myers Merrick. Mamma called her husband "Welc." I imagine short for Welcome. He was a shoemaker. Wouldn’t it be fun to trace them all back several generations, and know the things they did? Here is an article that my may interest you which has to do with Sally Bennett, dau. of Jeremiah who married Abram Kimber, son of Nathaniel Kimber. (several of the Bennetts and Kimbers seem to have married) . where he bought 800 acres of land and where he lived until his death. He had nine children. 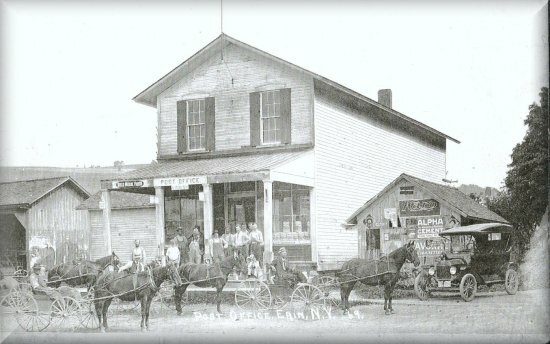 (See "History of Orange County N.Y. " by Ruttenber & Clark, pp. 674-675). George Kimber (son of Casper) bought about 225 acres of land in the Minisink Patent and moved onto it in 1750; he built a stone house which was used as a fort in the War of the American Revolution, and he died soon afterwards. George married Sarah Westfall, Oct 5, 1749, in Dutch Reformed Church, Machachenmech (now Port Jervis) N. Y. They had four children, George’s dau. Margaret married Henry Horton; their dau. Sally Horton married John Lain. George’s son Samuel served in the War of the Revolution, married Marie Bennett; their son Benjamin married Keziah Bennett. George’s son Peter, also served in the War of the Revolution, inherited his father’s homestead and lived upon it until he died March 14, 1817; married Elizabeth Clark, dau. of James Clark of Minisink; their son George, born Aug. 29, 1781 married Sarah Elston one of their children, Hannah, married Josiah Bennett. There was also a Peter Wintermute who lived in Unionville. I almost believe he was Aunt Sally Maria Myers’s brother, so her name could have been Wintermute, and she could have been the daughter of one of Jeremiah’s daughters. sisters I am only guessing again. Mamma said her greatgrandmother (the one with the gold pieces) used to say she was hi-low dutch. And from the above article some of them were married in the Dutch Reformed Church. We used to have a Bennett reunion, the descendants of Josiah and Hannah Kimber Bennett. It was going until just a few years ago, and had been meeting for 73 years at the time it was decided not to have them. Hezikiah Wilcox, (Aunt Sally Wilcox’s son) a lawyer here in town who died several years ago, started the reunion. One year they put in an Ethel Blair as Secretary, and she got mad about something and destroyed the Reunion’s records. She must have been some person. Going back to the Wintermutes. Sally Maria and Peter used to fight over the cherry trees that was on the line of their adjoining properties, so Mamma said Aunt Sally M. decided to kill the tree, then heated buckets of brine, and had Mamma help her carry them to the tree and pour the hot brine over the bare roots of the tree, then she put the earth back. Mamma said the next year the tree had the nicest cherries on it that it ever had, and aunt Sally M. said it much have wrong for her to try to kill the tree. I think it was just great for you to spend Christmas with your children in Florida. George and I have been to West Palm, and Palm Beach many times. One time we made a trip to Key West, and on the way back crossed over to Clewiston from either Palm or West Palm Beach, I’ve forgotten which, where we stayed over night, and later we went with another couple to Clewiston and went through the sugar mill there. I trust Bill, you will feel real well by Christmas. George had a heart condition for 19 years, and that is the reason we were in Florida. We were in New Port Richey, on the West Coast, for 16 years. My brother John and his wife and his son Don and wife still live in New Port Richey. I haven’t seen John and Edna for five years, but neither of them are well, and they weren’t too well when we left. John and I, and George went to school together when we were kids. I hope you will have a very nice day tomorrow. I will probably have dinner with Louise and Frank and the kids. They will come over after me, as I am not able yet to drive my car. I left it over home for Frank to use, and that lets Louise have their car to get around in. This is such a glorious day, I am disgusted to think I am laid up, for if I weren’t I surely would get out in the old bus. I have a 1956 Buick Special. Right now it has over 100,000 miles on the speedometer. I hope it will stay in running condition as long as I am able to drive. Clara and I have corresponded since we were young girls and Myron lived at Six Lakes, Mich. I have never met her, but I am sure she is one grand person. I think if I were younger I would try going out to see her. I am wondering if some on the Canada Bennetts could be decendents of Thomas, his father etc. etc. This genealogy of families certainly is interesting. My husband and I have the same common ancestor back in the 1700’s or 1800’s and the Derbyshires and Herringtons, Bennetts and Boydens, so far as I know are not related, but in the other hand they must be, but I don’t know how. Perhaps we should start with Adam and Eve. I have written this piece-meal for I get somewhat tired. I hope it finds you both O.K. Other than myself, my family are all well I am glad to say. Note: Italics are handwritten corrections and comments by Minnie on the letter.